Hondo to Rondo, the Boston Celtics have had some legends in their time as the most storied NBA franchise in hoops history. But from Bill to Bird and the truth of the big ticket, none are quite as iconic as the rivalry they have with the gold Showtime standard of the Los Angeles Lakers. After all every Batman needs his Joker. And the clown prince of crime is both purple and green so you figure out for yourselves who the real villain is here. Well last night the foe was an old friend. Ever since brunch with Bryant in Boston, many have wondered who would get the check for Point God Rajon Rondo to lead in L.A. as a Laker. Kobe loved the fellow and I quote “a##hole”. But alas breakfast could wait as they never did get to share the same best backcourt. But now still in his prime and teaching a young pass first like in Lonzo (who “ain’t going nowhere. Because it’s Bad Boy for life” following the trade deadline), Rondo is in La La Land. And returning to the Garden last night like flowers in spring-no matter how much former teammate Kevin Garnett wore his number nine jersey, next to Metta World Peace in his 37-he is is now in purple and glittering gold. Seems cold. But in a time where anything can happen-far removed from the time Laker role playing legend Rick Fox along with Gary Payton was traded back to the Boston he started his career from before big cut-believe it or not the Celtics legend is back in Boston as a Laker. And who knows who else could follow suit with LeBron doing that ‘Casino’, Rich Paul behind the jersey recru…sorry I mean talking to former Cleveland teammate Kyrie Irving (who had a Kobe 24 in the contest) like he did with the Lakers Ball last year as a Cavalier. But ask us all about that on July 1st. Because we won’t know what all these guys are going to do ’till this Summer. Then we will find out if the next chapter of the storied Lakers/Celtics rivalry will be the old allies of the King versus Kyrie. Or one that turns 80’s golden era volatile with a catalyst of burnt jerseys and the word “traitor” being thrown around like rocks at the throne like the first time LeBron left the land. But how was last night for a twist in the story? What a difference a couple of deadline days make. And after the worst week that saw the Lakers lose to a Victor Oladipo less Pacers by 42, after almost offering that many pieces of their young core to the New Orleans Pelicans for their free agent to be with a Hollywood dream like Paul George in Anthony Davis. The only thing this Brit wanted less than this deal was Brexit. As with chants of “LeBron’s going to trade you” rang out in Indianapolis fuelling the fires of anger like those rally cars on the 500, there may as well have been 42 or that many seats between the Lakers team and LeBron at the end of the bench. On television on the road the Lakers purple jersey looks blue. But make no mistake at what you saw in the Pacers fieldhouse, pictured courtside at the parquet after Magic wanted to trade more jerseys than Dwyane Wade’s last dance postgame. A picture says more than a thousand tweets (but check out the parody mic’d up feed from the hilarious Josiah Johnson’s feed. Who has a ‘Training Day’ with his Denzel Washington, “you motherf#####s will be playing basketball in Pelican (fitting) Bay when I’m finished with you” impression. Hash-tag: ‘Shoe Program’) about it. But after all that and core guys like Ball, Kuzma, Ingram and Hart on the block. As well as the entire meme team, every meme going on the internet and even the future of every draft pick that the wind could blow in the Lakers took their “outrageous” offer off the table. To no Anthony Davis, raised eyebrows and emoji jabs from the Pelicans Twitter (how New Orleans said no to a trade that with Randle basically makes them the young, promising Lakers of last year when they stand to lose everything for nothing is the real emoticon of disbelief). And those worrying about the Lakers giving up on a young core they’ve cultivated over four years of drafts resting easy. Although just look at D’Angelo Russell, Julius Randle, Larry Nance Jr. and Jordan Clarkson now. They’ve been doing this for years. Now it remains to be seen whether Zo, Kuz, Ingram and Hart will be the California soul future of this franchise when the King leaves his throne in this game. Or merely a great young fun couple of what could have been seasons, Los Angeles team like the classic, new millennium Clippers crosstown of Lamar Odom, Darius Miles, Quentin Richardson, Keyon Dooling and Corey Maggette. I mean with Randle they’ve already lost their Elton Brand. In the end the Lakers traded G-League Soiree by the South Bay, 47 point high man Svi Mykhailiuk to the Pistons for Reggie Bullock, who with a blindfold on could play ‘Bird Box’ from the three-point line like Sandra. And then they big mistake traded away favourites Ivica Zubac and Michael Beasley (at least we will always have the dancing GIFs and one of the greatest Laker moments in history telling a ref he was going to F’ Karl Anthony-Townes up) who have both been seriously stepping it up lately down the hall to their not so crosstown Clipper rivals in return for more perimeter muscle from Mike Muscala. But never fear, all this might finally open up a roster spot for free agent Anthony. Carmelo not Davis. Time to pull those hoods up. But last night none of that mattered in Boston as the “Beat L.A.” chants ran round like fans in their cars circling the hotel of the Showtime Lakers in the 80’s, honking their horns in the early hours before Game 7. But there was no splinters in the wood last night for these Lakers to be tripping. After LeBron’s crowning triple of 28 points and 12 in both rebounds and assists (to go with 17 apiece from McGee and K.C.P.). And the 25 points from Kyle Kuzma and his clutch dagger. Boston (Irving) put themselves up by one. But after losing by 42 the last game, all the Lakers needed after that many in the third was one more to make their point. And after Ingram’s drive was blocked like parking on someone elses lot, the ball fell to the 17 points, 10 assists and 7 rebounds of former Celtic Rondo, who in Lakers yellow had his day against the old green. Sinking a kneeling prayer from the elbow as the buzzer rang out and he was lifted above a sea of gold running off-court. Just days after the team were as apart as leaving your ring on the dresser. What a way to get a rejuvenating W on the road. And what a place to take it from. The Patriots may have beat the Los Angeles Rams. But Boston couldn’t beat the L.A. Lakers last night. From a standing ovation to start the game, to an 129-128 silencer by the end of regulation, Rajon Rondo made history back in his old hoops home with a moment even he couldn’t begin to believe. As the lastest chapter of Lakers/Celtics history was rewrote by one of its most central characters. Talk about that one over breakfast and Beantown coffee Boston. Phones have been checked in Philly as missing posters have been put on telephone poles for Ben Simmons’ jumper. Whilst he has started a beef with Jared Dudley of the Brooklyn Nets that even rivals the one between Kevin Durant staring down Patrick Beverley. Welcome to the 2019 NBA playoffs. But the real rivalry of this first round that is a real knockout is the one between Damian Lillard and Russell Westbrook. Two noughts to add up to something over nothing that could take this wild West clash between the Portland Trail Blazers and the Oklahoma City Thunder the seven game distance. Watching these two points make one in the changing of the guard has been where amazing hardwood history happens. And whether the Thunder will reign over Rip City, or whether the city of roses will bloom over OKC all depends on whether the fuse is lit for the stick of dynamite, or the ticking click rings out. Either way whatever adds up to more on the box score will come from nothing. But these numbers don’t lie. A Game 3 showdown saw Russell Westbrook explode with a Kareem 33 and the Thunder poured out a 120-108 victory back home as Paul George double pumped a dunk as time expired like old ham on Dame and his men. But up 2-1 it’s not like Portland could blaze a trail to put OKC on the ropes. Even though they want to even things up and take it down to the wire for the next game and week. D-Lill had 32. But Westbrook taunted that he was “too small” as he rocked the baby with one more point. Denis Schröeder also added 17 and a mock wrist watch tap celebration to Dame like Russell mocking Lance Stephenson’s air guitar against the Lakers. But time and Dame time again, hip-hop star Dame Dolla will play on until this all wraps up. Laugh now, cry later. Because this one rhymes greater than you’re average player hater. He’s notorious. He’s B.I.G. and he’s ready to die for one more chance to kick in the door, for the skys the limit. 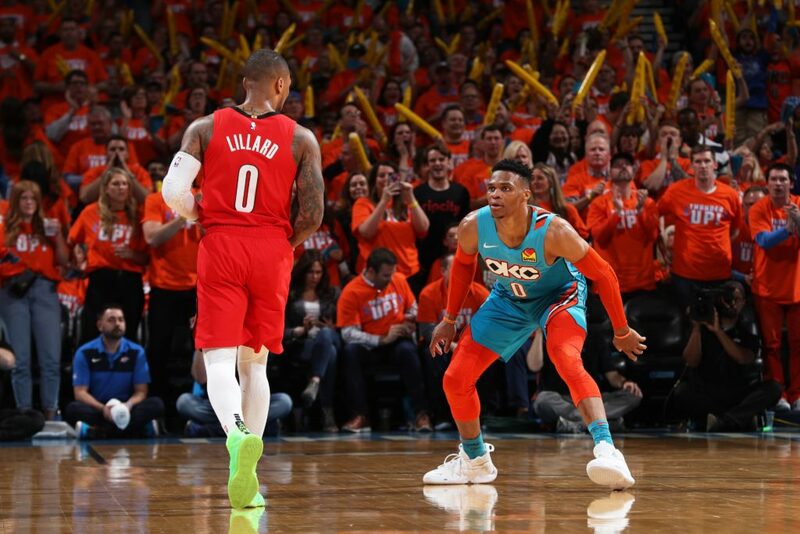 Dame Time runs 24/7 like a 7Eleven and with the ‘Mission Impossible’ fuse of Russell Westbrook never looking like it’s going to fallout like these two, we may need another P.G. by George to settle this score as these two Point Guard number noughts look to cancel each other out until the final score and last buzzer beaten rings out. Trash talking. Sweat soaking. Until the clock runs out on Dame Time and one of our zeroes becomes hero, we could watch these two men go the full magnificent seven. 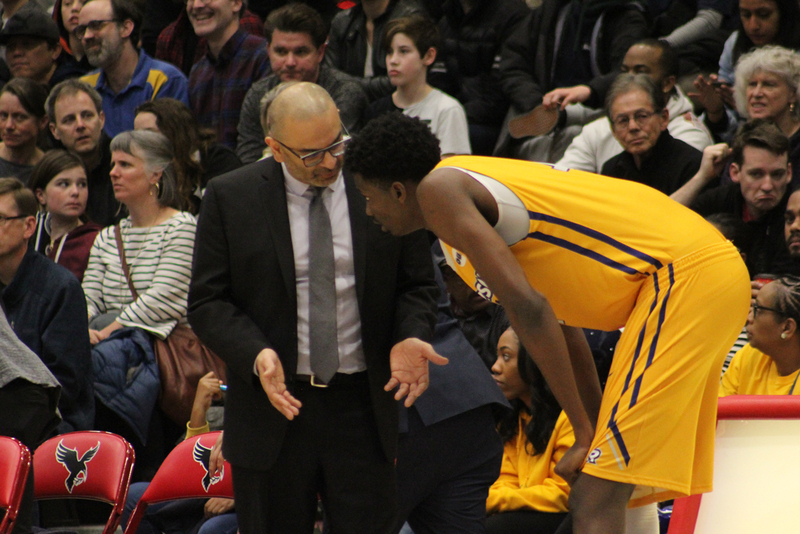 Ryerson Rams’ 7-foot-2 center Tanor Ngom has declared for the 2019 NBA Draft. 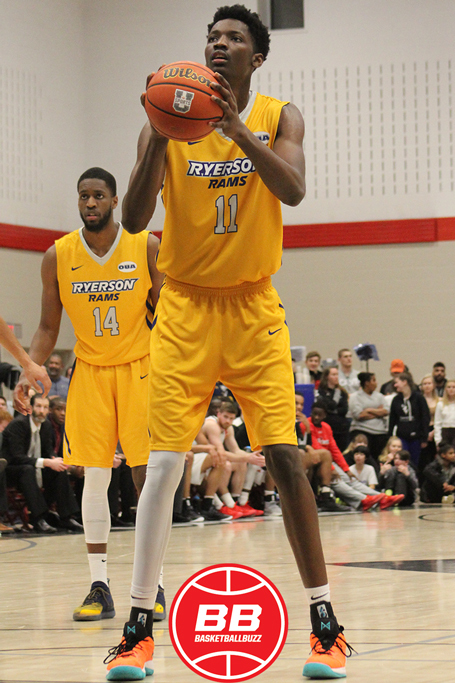 Ngom, a native of Dakar, Senegal, enjoyed a breakthrough sophomore season with the emerging Ryerson Rams’ of Canada’s U Sports basketball program — in 21 Ontario University Association (OUA) conference games, he averaged 11.3 points, 5.6 rebounds and 2.3 blocks in 19 minutes — connecting on 63.8% of his 88-138 field goal attempts. Ryerson University's Tanor Ngom will enter the 2019 NBA Draft, his head coach @Roy_Rana confirmed to ESPN. The 7'2 big man had a solid showing at the Nike Academy in Los Angeles last August, as well as in a preseason game against Duke. Rams’ head coach Roy Rana discovered the late-blooming Ngom back in 2017 when he and a few of his players travelled to Senegal to take place in a basketball exchange forum. During his freshman campaign Ngom faced adversity of coming to a new continent and adjusting to the North American culture while learning the game from one Canada’s best masterminds. Appearing in 23 games the towering bigmen contributed 5.8 points, 4.2 rebounds and 1.3 blocks in 12 minutes as the Ryerson Rams advanced to their first national title game. Ngom’s improvement has been clearly evident in his two campaigns under Rana and features impressive mobility and athleticism for his size. A natural defensive disruptor — Ngom has worked hard to build his thin frame and expand his improving shooting touch from the charity stripe to the three-point line. Ngom posted a career-highs in points (24) once and grabbed 11 rebounds on multiple (3x) occasions as well as swatting away 8 shots once. Additionally, he reached double-figures scoring in 10 of his last 15 games. The seven-footer posted 12 points, six assists and three blocks in 24 minutes of action against the Duke Blue Devils during their much anticipated Canadian Tour. Ngom also became the first Canadian university player to participate in the prestigious Nike Elite Basketball Skills Academy — bringing the 20 best collegiate players together for a five-day premium training experience. Unlike the recent NCAA rules changes that allow a player to test the NBA Draft process and still return to the collegiate ranks — The U Sports eligibility model and NBA Draft process aren’t quite clear at this point. Regardless, Ngom’s path to the NBA faces a steep uphill battle — becoming the first player since Ottawa Gee-Gee’s All-Canadian guard Warren Ward broke barriers by tossing his name in the 2013 NBA Draft process — gathering buzz with a respectable workout at Impact Basketball in Las Vegas. Canadian William Njoku (Halifax, Nova Scotia), a 6’10”, 193-pounds forward from the Saint Mary’s Huskies holds the exclusive distinction of being the last player from a Canadian university to be drafted in the modern NBA era. The Indiana Pacers selected him with the 41st pick in the second round of the 1994 NBA Draft. Brooklyn born, Brian Heaney, a Canadian Basketball Hall of Famer and a member of the 1965 Acadia University Axemen championship team was drafted by the Baltimore Bullets with the last pick (19th round / 215 pick) of the 1969 NBA Draft. Heaney still holds the Canadian University single-game scoring record with an eye-popping 74 points against Mount Allison on February 17, 1968. Carleton Ravens’ all-time great point guard Phillip Scrubb — arguably Canada’s best university basketball player of all-time — never declared for the 2015 NBA Draft — but managed to play in the 2015 NBA Summer League with the Memphis Grizzlies and the Toronto Raptors. Although not a common stake yet, it is inevitable that Canadian players declaring from Canadian universities to the NBA draft will one day, in the not very distant future become commonplace.